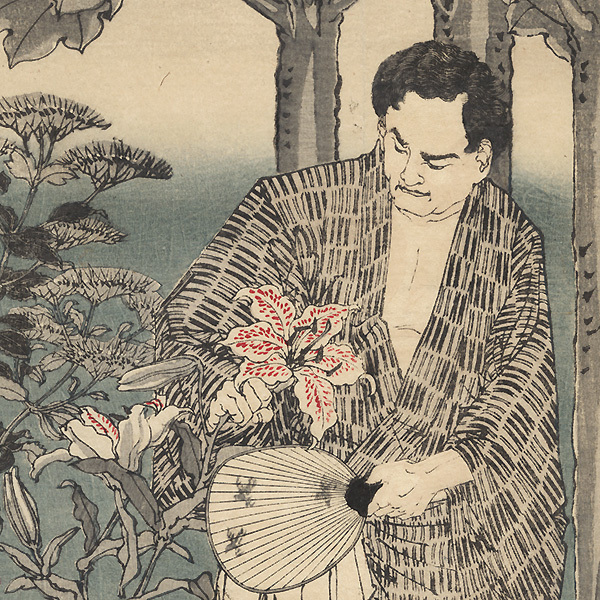 Endo Shimpei Standing in a Garden, 1887 - Terrific image of Endo Shimpei (1834-1874), the first Meiji Minister of Justice, admiring a large lily in his garden. The Meiji government faced a huge problem in converting from a samurai society to a modern army, since a peacetime army could not accommodate all the displaced samurai into its ranks. One suggestion was to go to war with Korea for no reason other than to maintain the position of the samurai within a larger army. When the government turned this proposal down in 1873, Endo resigned his position and returned home to Saga to lead a rebellion against the government. He died on the battlefield the following year, and the rebellion was suppressed. This is a melancholy image of a man who has realized that the samurai way of life was ending. 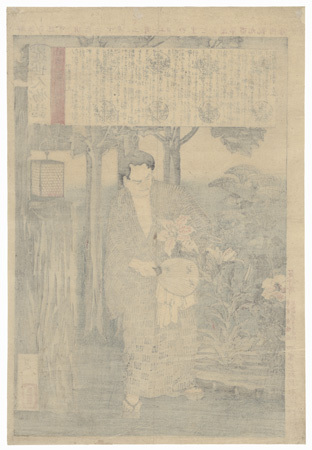 He is dressed in a simple cotton robe, pausing to admire the unchanging beauty of nature in the face of tremendous changes to Japanese life in the modern era. Note the lantern hanging from a notch cut out of a tree at right, an interesting detail. A handsome Yoshitoshi design, beautifully drawn. Condition - This print with excellent detail as shown. Vertical centerfold. Small hole, repaired. Slight toning and creasing. Please see photos for details. Good overall.